This scripture came to mind as my Rose started on a new instrument last week. 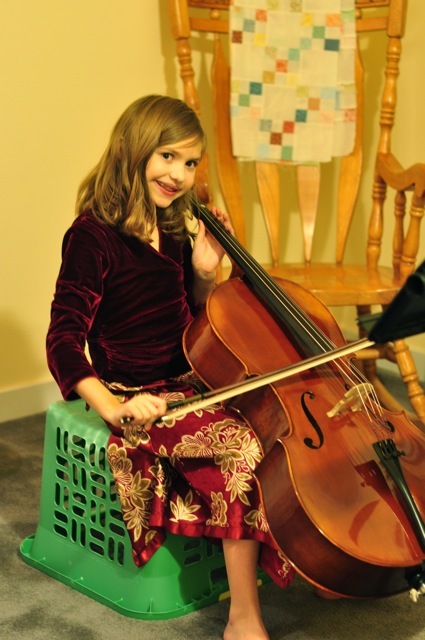 She chose the cello for several reasons. First, because she knew a woman from church who gave cello lessons, second, because she liked the sound, and third (and maybe most importantly), because it's an instrument that Lucy and Bruder have never played and could therefore offer no advice. So far, one week into it, Rose and the cello have been a love match. However, I've been through enough beginning musicians to know that won't always be the case. We've decided that Rose will practice the cello in the master bedroom and we've made her a little "cello corner". None of our chairs allowed our petite Rose to sit with her feet firmly planted on the ground, so we've found that an overturned laundry basket is our best solution. Her half sized cello still looks so big for her and when she carries her massive case on her back, I have to stifle a laugh. After supervising Rose's practice, I went downstairs and heard Lucy singing an Italian aria. I haven't really stopped to listen to her sing in a long time. It's just kind of background music to my day. It struck me last night just how much she's improved over the past few years of voice lessons and that she sounds downright professional. After she finished, she practiced the piano, something I haven't had to prompt her to do in years. Bruder brought his guitar down to the kitchen and we had an impromptu sing-along with him strumming songs from several different eras. He was mostly self-taught and now with consistent lessons over the past several months, has improved by leaps and bounds. He writes his own music and often surprises us with his compositions. I never have to ask him to practice. I often have to ask him to stop so I can hear myself think. So when Rose asked last night if I thought that her cello teacher had to start by plucking the strings just like she's doing now, I told her that I'm sure that she did. If there's one thing I've learned as a parent over the past 16 years, it's that by small and simple things are great things brought to pass. Can't wait to hear our Rose in a few year's time. Wow..so fun! I love the cello. I have cousin who plays it beautifully. Jed got an "electric" guitar for Christmas and is starting lessons soon. Summer is asking to play violin. But I haven't decided between that or piano. I took piano for 10 years and it seems like a good place to start. But then there is the fact that she "wants" to play violin. I'm not sure what to do.. I agree that piano is a wonderful starting point, but I also think if a child has a love for an instrument, it's great to encourage that. I pushed Bruder with piano for years, but it was such a struggle. When he came to me begging to play guitar, I doubted that he'd stick with it, but he absolutely proved me wrong and shows musical talent that certainly never manifested itself when he was playing the piano! I do think that the time playing piano wasn't wasted and helped him transition over to another instrument. Lyle's mom, an accomplished pianist, told me that she always waited until her children were begging to play before starting lessons. She'd often hold them off, making them even more excited, by saying things like, "Well, I think when you get a little older...." Unfortunately, that didn't work with her dear son, Lyle, and he's a rare Beck child who doesn't play the piano. Of course, he totally regrets it now. Cholita is dying to start an instrument. Just DYING! We're looking into getting her going, but I don't want to start her too early and have her be frustrated. We'll see. Besides, one beginning musician is a big commitment for the mom and I'm not sure if I'm ready for two!